Last weekend the North East Newcastle & Gateshead Big EAT! Festival drew to a reluctant close. That’s the NE’s culinary celebration, running from July 13th-29th, across the region, for those of you not in the know. We went along to a couple of the final events on Sunday because, as I’m sure you’ve noticed, eating is one of my favourite things to do. Sadly we didn’t make it to all of the events throughout the EAT Festival, due to work, children, and various other commitments. Next year I will be making more of an effort to attend more of the events. Especially after having seen how well organised the ones we attended were. We set off down to Central Station, Sussex Street to be precise, to a warehouse that was far from deserted. The EAT! 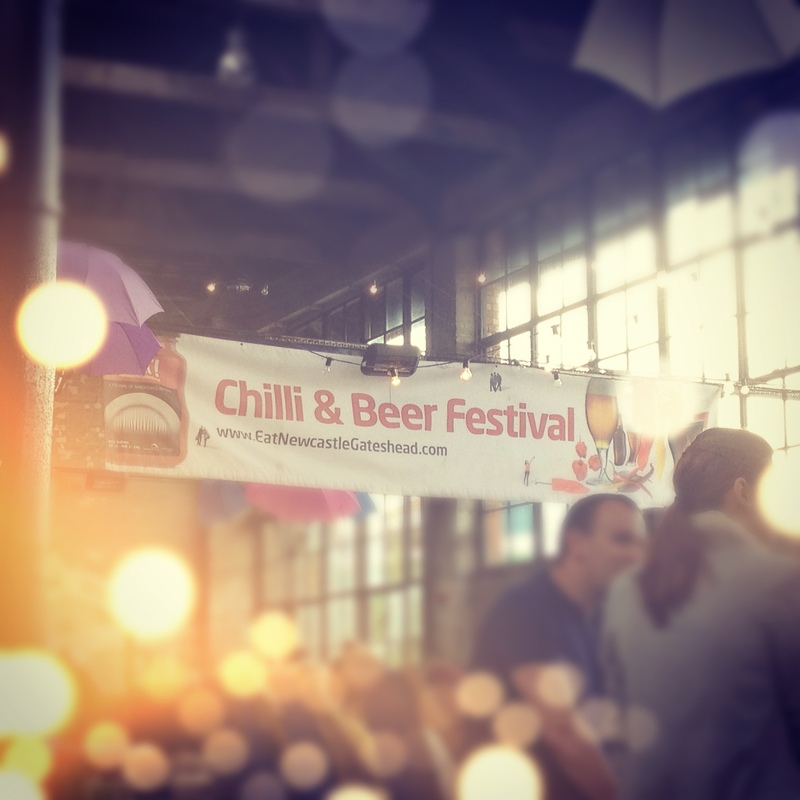 festival were throwing a Chilli & Beer festival. 22 different beers, 11 ciders and 3 pop-up restaurants. What better way to spend a Sunday? We had my other half’s 9 year old son with us which presents a challenge in itself as he’s not the world’s biggest spicy food fan. We’re working on it, and he now lets me add more spices to curries, and gets involved with the cooking himself, controlling how much of everything we put in, which seems to help, but in general he won’t like something if it’s quite hot. But we pressed on anyway thinking it might be a nice thing to get involved in and to keep us out of the house and in the sunshine for a few hours. And we weren’t disappointed. The warehouse had been thoughtfully decorated, rather than derelict it felt quite cosy inside, and we found a number of interesting pop up stalls inside. There were of course chilli stalls, and samples for tasting different flavours and different strengths of chilli powders, pastes and sauces. There was a chilli roulette which provided my partner and his son with some entertainment, daring ‘Dad’ to spin the wheel and try the hottest chilies. There was a stage with a band playing and a large bar heavily stocked with beers from around the world (not that we really tried any booze with having the child in tow, but nice to see all the same) and those stalls from various restaurants across Newcastle including Dabbawal, Newcastle’s resident Indian Street Food restaurant. I had previously eaten in the Dabbawal restaurant on Highbridge, and thought the food was fantastic, really delicious and interesting. Each dish was perfectly presented. We tried a sort of lunchtime Indian tapas affair and thoroughly enjoyed ourselves. But that’s a story for another time. There were also stalls selling chilli plants. I had no idea chilies came in so many colours. I fell in love with a ‘Twilight’ Chilli plant, which grows royal purple chilies. Beautiful! Unfortunately they don’t stay purple when you cook them, they turn green with the heat, but they look great raw, chopped up finely and tossed in a salad. We even managed to get the boy to sample some jalapeños (and like it! ), to munch some nachos with chilli, and some spicy vegetable samosas, and sample some of the hot chilli pastes on offer, courtesy of the Trees Can’t Dance sauce company. There was also a kid’s area where he could plant a chilli tree and be shown how to care for it and build a little make-do greenhouse out of a Robinsons juice bottle. We were having a nice time, with full tummies, chilling in the blue NE1 deckchairs and watching the band play, when we heard about the next EAT! event; the bake sale. Of course we had to try that too! So off we headed, back into the summer sun, across to the other side of Newcastle city centre, to The Biscuit Factory. Already one of my favourite spaces in Newcastle, it was also now, for one day only, filled with cakes! J’adore! It transpired that some of Newcastle’s best loved and/or little-known bakeries had each put on a stall in the style of the good old-fashioned bake sale, in order to sell their wares, all in the name of the NE EAT! festival. I can only hope Mr Sarahbosson will still love me when I’m the size of a house. So yes, by the time we got back home on that Sunday afternoon, just in time to snuggle up for a nice Dr Seuss movie, we were very contented indeed, filled to the brim with a mixture of tasty food and Geordie festival spirit. Just goes to show you don’t always need to go too far from your front door for a bit of culture.